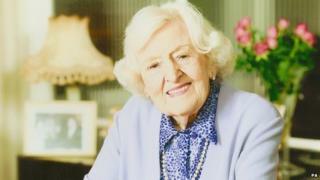 Cookery writer and wartime broadcaster Marguerite Patten has died aged 99, her family has announced. Mrs Patten told the country how to make the most of its rations during World War Two and went on to front her first TV cookery show on the BBC in 1947. The author, widely considered to be the first celebrity chef, wrote more than 170 books and had worldwide sales of more than 17 million. Her family said she died on 4 June "from an illness stoically borne". Born Marguerite Brown, in Bath, she first learned to cook for her family, aged 13, after her father died and her mother had to return to work. She worked as a home economist at the Eastern Electricity Board, as an actress in repertory theatre, and a promoter of the Frigidaire refrigerator brand. During World War Two, her cookery ideas were broadcast on the BBC radio programme Kitchen Front. She was a regular contributor to BBC Radio 4's Woman's Hour programme from 1946 and made her final appearance in 2011. Mrs Patten refused to describe herself as a celebrity chef, telling one interviewer: "I am not. "To the day I die, I will be a home economist." She has had countless TV and radio shows and was awarded an OBE for services to the "art of cookery" in 1991 before becoming a CBE in 2010. Mrs Patten, who had a stroke in 2011, continued to contribute to TV and radio food programmes into her 90s. Food critic and broadcaster Jay Rayner tweeted: Farewell Marguerite Patten, a long life well lived. I interviewed her a few times and she was always a delight.